Vacationing in Santa Fe, my wife and I decided to play the slight risk in NE New Mexico today. Approaching Las Vegas around 1:45 we could see two nice looking storms to the NE. Here is a nowcast from NWS ABQ describing the storms. I thought the storms were between Springer and Raton, but they were in fact farther - between Raton and Trinidad, and in CO, not NM. Things are farther away than they seem out here! As a result of this misjudgement, we cut east from Springer toward Clayton, but it really didn't matter - as the storms moved east into the more capped atmosphere, they died out as we tried to cut north to them. We ended up near Des Moines - I now see why chasers a week or two raved about the scenery in this area - quite spectacular. 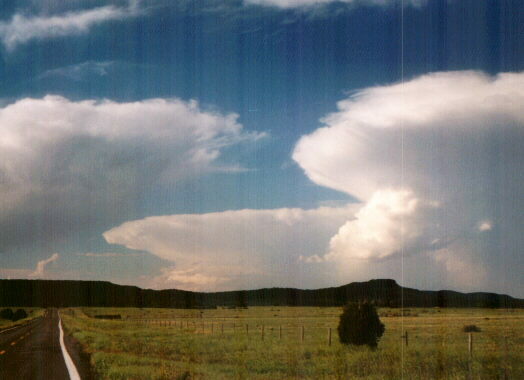 We decided to drive to the top of the Capulin Volcano cone - somewhere around 4:30 or 5:00, I believe - and at this time a new storm exploded just to the NW. It was high-based but looked like it had some LP supercell characteristics for a while - sort of had the barberpole look for a short time. Though this was the best look we were to get at a storm today, and it did not go severe, the view of such a pretty storm from 1600 feet above the surrounding terrain at the top of the volcano kept the day from being anything close to a bust! 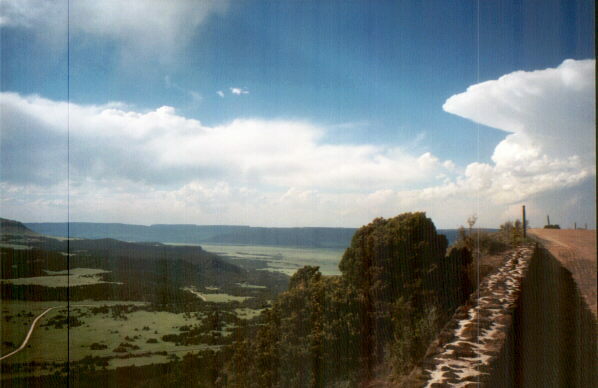 In fact, the spectacular scenery of this part of NM, along with the variety of wildlife we saw, would have made the trip worth it had there been no storms at all. We pursued the storm north until around 5:30, but as it displayed no lowerings and remained very high-based, we broke off and headed back west toward Raton. Shortly thereafter, the storm weakened dramatically. 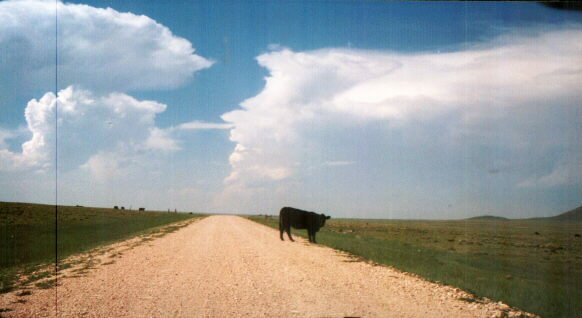 Around the time we broke off the chase, a severe thunderstorm watch was issued for the area we had been in. Although the storm closest to us died out fairly quickly, the next storm north in Colorado did persist for a while. 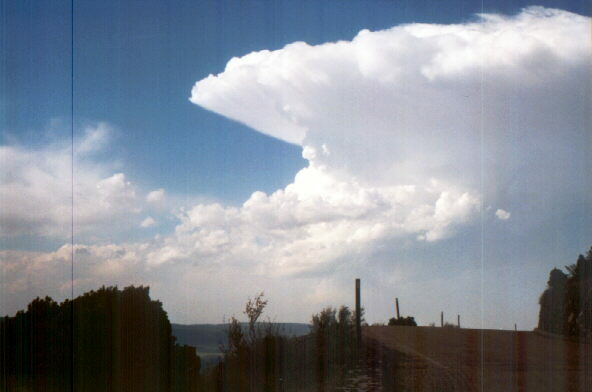 Here is an image of the two storms, the more distant one being by far the stronger, as the closer storm we had been watching weakened and became more high-based. This nowcast fron NWS ABQ discusses these storms. I did get a few interesting, though marginally chase related, pictures on this outing. 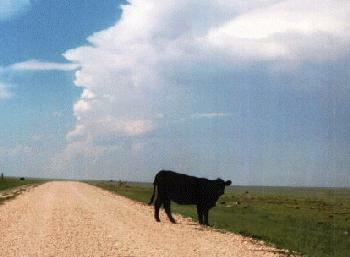 One interesting one is a cow standing in the middle of the road, with the first storms in clear view directly behind it - LOL! 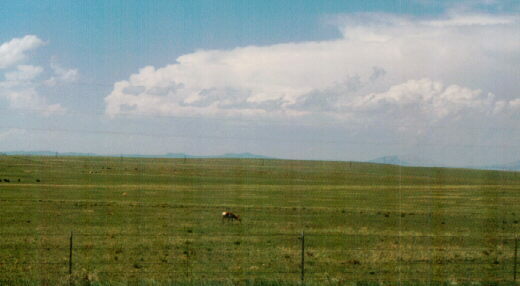 And also a similar shot of an antelope in a field with the storms behind - one of many antelope we saw over the course of the day. But I think the best are the mountaintop views of the later storm. Total chase distance - about 470 miles.